The Tochigi Prefectural Museum of Fine Arts opened in 1972 as one of the first public museums of modern and contemporary art in Japan. Kiyoshi KAWASAKI designed the museum architecture including the collection galleries built in 1981. 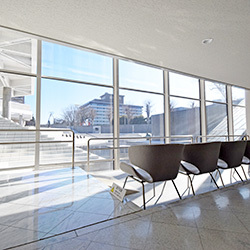 The museum houses a collection of Japanese modern and contemporary artworks, primarily those with connection to Tochigi Prefecture. It is also notable for the works by famous artists of Western Europe such as France, England and Germany. The collection comprises around 9000 objects, including prints, illustrated books, photographs, and crafts. We hold 4 special exhibitions a year in addition to collection exhibits rotations. In the Meissen Porcelain Collection Room, around 100 works are displayed. The exhibits from the best collection of Meissen porcelain in Japan are rotated about 4 times annually. The museum is an institution for societal education. At the same time, we aim to be utilized by school education. We carry out research, collection, preservation, education, and promotion that will be useful to visitors. Additionally, we maintain an aesthetic environment in order to liberate the mind. Exhibition, collection, preservation and research relating to art works. Active participation in national and international art scenes. Various activities (lectures, concerts, performances, workshops, etc.) for the improvement of art and culture. Close relationship with school education. Presentation of artistic circumstances for refinement of the mind. Cooperation with friends and affiliated organizations.